Simple but fanciful cocktail details do make parties look extra elegant. 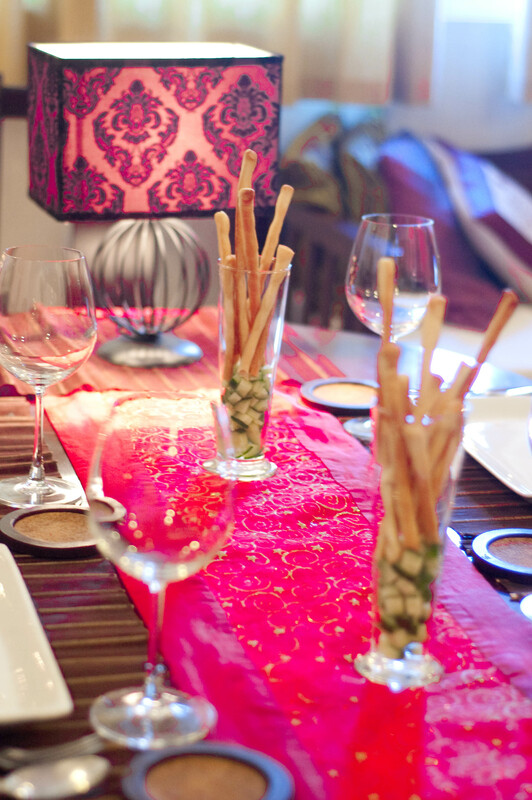 Very recently, I hosted a lunch at home and had these garlic sticks to go with my smoked bangus pate. 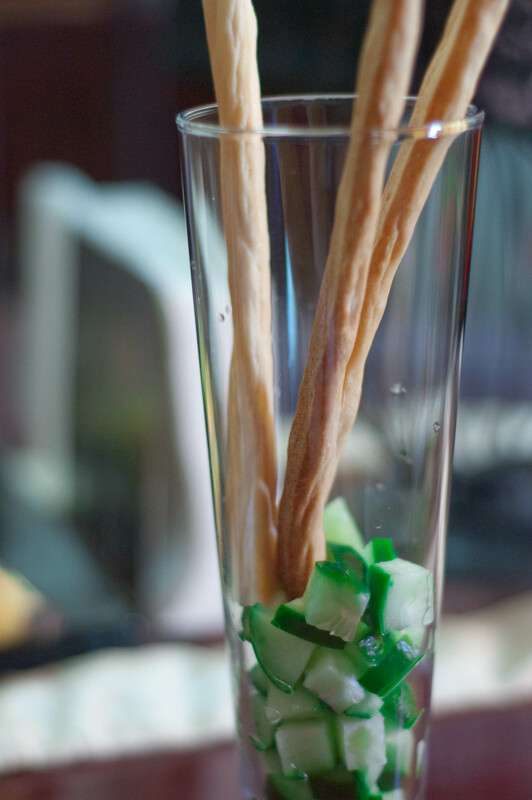 I thought the shake glass was too tall for my sticks that was why I did some “apple box” for it by using cubed cucumbers. Why, I loved how it turned out! My smoked bangus pate has never let me down. An instant crowd pleaser for its very delicious taste, I always whip this up when there’s any gathering at home. So engaging to eat, you’ll never know when to stop! It’s perfect, too, with crostinis and even on french bread. I’m using here a file photo of my smoked bangus pate I took a few months ago since I failed to take pics of the one I made recently that we ate with the bread sticks. Was a busy bee doing preps that taking pics totally slippped my mind, tsk. I hosted a lunch thing for a photo shoot that would feature this author’s cooking for their magazine’s valentine issue. Hopefully, the pate pic would come out in the feature. I used shot glasses for my pate. 6 guests had one shot glass of smoked bangus pate each to savor with the bread sticks. It looked really elegant and picture perfect. In a blender, put in one piece of medium-sized fried smoked bangus fillet (minus the head, tail, skin and bones), 1 box of cream cheese, half cup all-purpose cream, 2 tbsps lemon juice and salt and pepper to taste. Pulse until smooth and creamy. 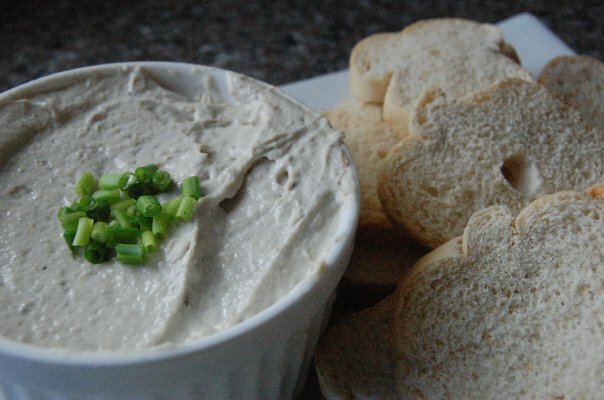 Serve with crostini rounds. Thanks a lot for the comment. This blogsite naman really aims to reach out and teach. Glad to be a third hand in the kitchen. Thanks again! hey caren! not sure if i can find smoked bangus here…can i substitute smoked salmon or tuna…or any other kind of fish? Hi, Lisa! Yes, definitely. Salmon, tuna or bangus would be great alternatives as well. Goodluck!